The aim of this article is to give an overview about Port Investment Guidelines. Inland ports are of special importance for landlocked countries in the Danube region as they facilitate access to a navigable waterway as the most economic and environmentally friendly transport mode, thus providing the countries all benefits of economies of scale and size. For other countries, inland ports are important as hinterland hubs for seaports and for the local industries. Seaports, on the other hand, are the most logical entry and exit points for countries with direct access to maritime transport and therefore are strategically important. In this view, financing of port infrastructure development is of crucial importance for economic development of a country and the region sharing the same waterway. Financing of port infrastructure, however, requires significant financial means, although significantly less funds then rail or road infrastructure financing. Provision of necessary funding is a role of national, regional or municipal governments, while private participation in port infrastructure financing and operation is on the rise in the last years. In their constant quest for development, port authorities in the Danube region have engaged considerable financial means to develop, rehabilitate and/or modernize their ports. This report demonstrates that the investment needs for the projects that are planned to be completed before 2030, a year which matches the deadline for the full establishment of the core network on the Rhine-Danube Core Network Corridor, reach a total amount of 5.5 billion Euro, only in the 19 selected ports in seven Danube region countries. For some of these projects funding has already been secured, while the large majority of planned projects are yet to secure the necessary funds. 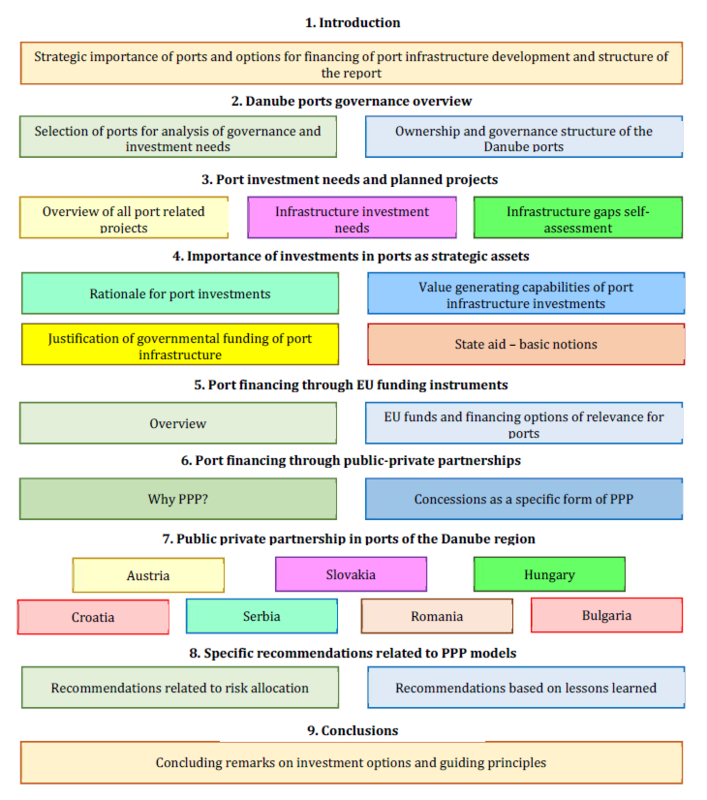 This report demonstrates the possibilities for port infrastructure financing out of own funds, usually in combination with various EU infrastructure funding instruments or the combination of public and private financing through various forms of public-private partnership (PPP). PPP is seen as the most attractive form of financing, especially in the condition of scarcity of funds. From the point of view of riparian countries, various guidelines and recommendations are given. Austria, for example, recommends the transformation of port authorities into commercialized or corporatized entities so that they could work under the commercial law (company law) and thus perform faster and easier business relations with port tenants and lessees. Slovakia, however, recommends clear and specific PPP legislation which would clarify the issues on priority investments, land lease and payment methods. Hungary, on the other hand, applies long-term concessions which were directly agreed, with no public tenders, and the only issues recommended to be solved are the conditions for concession termination. In Croatia, main recommendations are focused on resolving the issues of land ownership, where for efficient PPPs, including concessions, the land should be state-owned. In addition, it is recommended that the concession granting and re-negotiating rules should be more flexible. Serbia recommends such legal background which provides a level playing field for all parties, caution with land issues and determination of the port land as “good of common interest” before any concession plans. In addition, transparency, flexibility and clarity in concession conditions and payment methodologies (calculation of fees) are also highly recommended. Romania recommends, above all, the clarity and precision of PPP legislative framework, clear guidelines for PPP procedures implementation, better training on PPP procedures and even a regional agency tracking and assisting PPPs. Bulgaria recommends more autonomy of port authorities in terms of decision-making on concessions, as well as keeping the incomes from the concession “in the house”, that is, within the port authorities so that such revenues could be used for further port development and infrastructure investments in ports where concessions are not convenient, not applicable, not possible, not attractive or not planned. Finally, apart from flexibility requirement, the report contains recommendations that the risk allocation process in PPP agreement design is carefully performed and agreed since the significant part of the negotiation “package” between the port and the private sector during the tendering process belongs to the process of risk allocation. When PPP agreements involve capital investments, negotiations for risk allocation frequently include potential lenders.